We have done a little “adding” and “rearranging” of the top bar at SewWithSarah to make it a little more user friendly. You will now see a category for “Pattern Making”, which is specifically for all of our pattern making and pattern changing classes. You can see everything at a glance. NOTE: Don’t forget all of the Plus Size children sewing patterns are now 60% off (reg. $14.95 – now $5.98), as we clear out the physical patterns to make room for downloadable plus size children patterns. These are going fast, so if you or somebody you know sews for plus size, overweight or obese children, check out the patterns soon. We will be adding some adult average size and adult plus size sewing patterns soon, so keep an eye out for them. 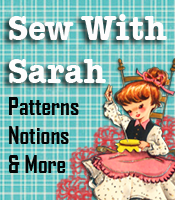 From now through May 31 use the code SUMMER to get a whopping 50% discount on ALL downloadable Pattern Making and Pattern Changing classes at http://SewWithSarah.com! Fill your cart with all the downloadable classes it will hold – ALL at a Super 50% Discount, using the promo code SUMMER and get ready for summer sewing now! However, we rarely mention increasing your services by doing specialty sewing for plus size and full figure women. At the BigBeautifulPeople website you will find pattern making classes that will teach you how to take the individual woman’s measurements and make patterns specifically for her. In addition we do have a few ready made patterns that you can use for the 1-5x sizes. While you’re expanding your business to take in the plus size and full figure women, why not include some sewing for men? Again at BigBeautifulPeople we have a pattern making class on how to make patterns for the big, tall and large men. We’ve found that if you want to make patterns for your customers, we suggest that you start with the basics — skirts and slacks. These are usually the harder garments for full figure women to get to fit, but are the easier ones for you as a pattern maker to make. Use the pattern making classes to make a few patterns for yourself, just to get comfortable doing the pattern making, then go ahead and talk to your customers about doing patterns for them. Did you know that November 9-13 is National Distance Learning Week? Distance learning is just what it sounds like — instead of driving downtown to the local college to take a class or two, you take classes online from various colleges or websites that offer classes you might be interested in. The benefit of taking online classes is that you can learn your subject at your own pace and in the comfort of your own home. If you work days, you can spend part of your evenings working on your classes; if you work nights you can spend part of your daytime hours working on the online class. If you are wanting to get a bachelor’s or master’s degree you would obviously check the colleges that offer online classes to see what would appeal to you. If you’re wanting to sharpen your sewing, crafting or quilting skills or learn a new skill like pattern making, you could run on over to PatternsThatFitYou.com and check out the wide variety of classes available there. BigBeautifulPeople.com also has a variety of classes and patterns for the plus sizes. How many times have you registered for a class at your local fabric store or adult education classes and had them cancelled at the last minute because not enough people signed up to take the class. In addition, how many of those classes would you have liked to take but couldn’t because your work schedule didn’t allow you to sign up. Distance learning (online classes) are so convenient – no matter what your work schedule is, and no matter if you work better early in the morning or late in the evening, the online classes will work into YOUR schedule. Give distance learning a try and see for yourself how easy it is to learn a new skill or sharpen the skills you already have. Once you try it, you’ll be hooked!